Celebration Dinner for Two. 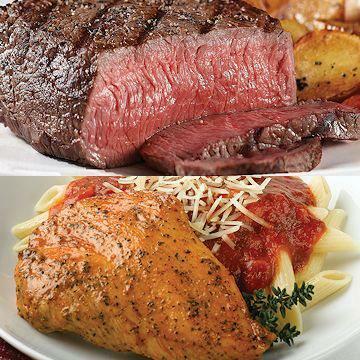 Send the best this year with a duo of delicious dinners. This meal features mouth watering fork tender gourmet steaks that are sure to impress everyone on your gift list. The delicious Italian chicken is easy to fix, incredibly elegant and an entree they won't soon forget! We supply the food, you supply the celebration. This steak has no exterior fat so be careful not to overcook. It is excellent for calorie counters who want a light luncheon entree. Please refer to the Steak Cooking Chart to prepare. This steak would also slice well for stir-fry, or would be excellent in your favorite stew. Beef, Pork, Lamb, Veal and Poultry have been born, raised and harvested in the USA. These boneless, skinless, chicken breasts are already precooked. They may be thawed, sliced and served cold. From Frozen: Bake: Preheat oven to 400�F. Place chicken breasts on foil lined baking sheet. Heat for 12-15 minutes. Microwave: Place chicken breasts in microwave safe dish. Cover with paper towel and heat on HIGH for 2-2 � minutes. From Thawed: Bake: Preheat oven to 400�F. Place chicken breasts on foil lined baking sheet. Heat for 8-10 minutes. Microwave: Place chicken breasts in microwave safe dish. Cover with paper towel and heat on HIGH for 1-1 � minutes. Broil or Grill: To warm, preheat your broiler or grill. Warm chicken breasts for approximately 3 minutes per side. Contact Grill: Grill 2 � -3 minutes. Do Not Thaw! Microwave (1100-WATT):*Remove cellophane covering Roasted Garlic Mashed Potato tray. Microwave on HIGH for 3-4 minutes. Stir potatoes. Return to microwave and cook for 1 minute. Let rest 1 minute before serving. Oven: Preheat oven to 350�F. Remove cellophane covering Roasted Garlic Mashed Potato tray and place on baking sheet. Bake for 45-50 minutes. Let rest 2 minutes before serving. *Create Parmesan Cheese Roasted Garlic Mashed Potatoes, by sprinkling 1 tablespoon of grated parmesan cheese on each tray of potatoes prior to placing in the oven. Preparation: Do Not Thaw! Microwave (1100-WATT): Cut slit in center of film. Place tray in microwave; cook on high for 2 minutes. Carefully remove film, stir and cook on high for 30 seconds or until internal temperature reaches 165�F. Stir and serve. Oven: Preheat oven to 400�F. Carefully remove film from tray before baking. Place tray on baking sheet on oven center rack. Bake for 28 minutes or until internal temperature reaches 165�F. Remove from oven, stir and serve. Ingredients: Water, Potatoes, Dehydrated Potato, Sour Cream (Grade A Milk, Cream, Less Than 2%: Nonfat Dry Milk, Corn Starch, Guar Gum, Carrageenan, Locust Bean Gum, Enzymes, Cultures), Butter (Pasteurized Cream, Salt), Dairy Blend (Whey Solids, Nonfat Dry Milk, Soy Flour), Roasted Garlic, Salt, Garlic, White Pepper, Parsley. Contains: Milk And Soy. Produced In A Facility That Also Processes Wheat And Egg Ingredients. Ingredients: Salt, Dehydrated Garlic and Onion, Spices, Dextrose, Natural Flavor, Dehydrated Bell Pepper, Dehydrated Orange Peel, Sugar, Citric Acid, Extractives of Paprika, with not more than 2% Calcium Silicate added as an anticaking agent.